ONE of Donegal’s best known companies has gone into receivership. Kilmac Form Work Ltd, based in Kilmacrennan, has been taken down by ACC Bank. Owner John O’Donnell was among a number of Co Donegal businessmen who lost money investing with well-known roly-poly French crook Francois de Dietrich. In February last year Mr O’Donnell was one of two businessmen who took a High Court case freezing de Dietrich’s ill-gotten gains. He lost €74k in the scam. Declan Taite and Paul Kennedy from RSM Farrell Grant Sparks have been appointed as receivers by ACC Bank. The decision was taken yesterday, donegaldaily.com has been told. 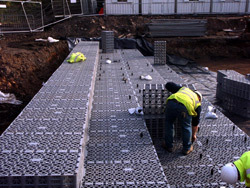 A well-known construction company, Kilmac specialised in shuttering, concreting and steel fixing. A source close to the company said Mr O’Donnell is “devastated” by the move but admitted it had been struggling since the downturn in the construction industry. As bills piled up another company secured a court judgement against Kilmac Form Work for €75k last year. But it was the collapse of McNamara Construction which sounded the final deathknell of the business. John O’Donnell was exposed to losses of €200,000 as he was working on three McNamara projects when that company was put in receivership. Along with the new county library in Wexford, Kilmac Formwork was working on projects in Counties Galway and Dublin for McNamara Construction. “No one knew this was coming, it came out of the blue,” said Mr O’Donnell at the time. He said they were to be paid a total of €250,000 for their work on the Wexford project but lost out on a further €60,000 on that one site – a library. It is understood that Michael McNamara Construction owed more than € 20 million. A large proportion of that was owed to sub-contractors. Ironically one of the two receivers appointed to Kilmac Form Work – Declan Taite – was also appointed to McNamara when it went into receivership.